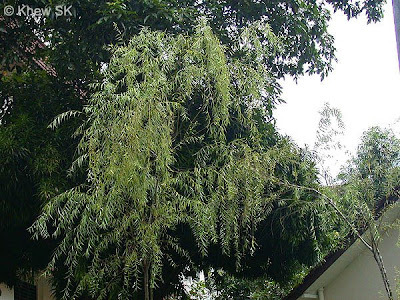 This month, we feature a rather common urban butterfly that is "resident" whenever the characteristic Weeping Willow tree (Salix babylonica) is cultivated. The host plant is a sculptural tree that is a favourite with landscape architects, gardeners and tree lovers for its dramatic appearance and rounded, weeping shape.. The Weeping Willow's grace comes from its sweeping, low branches that droop to create its familiar “falling” canopy. The month of July normally sees hot and humid conditions as the full effect of summer is felt around the northern hemisphere. However, it is still strangely wet for July as far as Singapore is concerned, with many days of rain over the past few weeks. But in these hot months, and the prospects of the El Nino effect hitting countries around the world, rain is always welcomed. The imminent haze from the slash and burn habits of neighbouring countries has also been somewhat lessened by the rains. The Leopard's wings are coloured a bright cheery orange and are ornamented with black spots and streaks. The underside is paler, with the spots and streaks less defined. 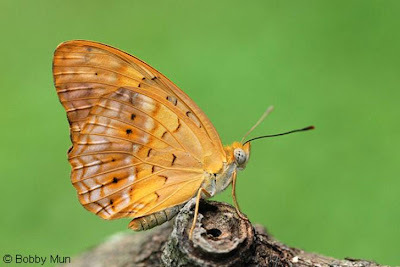 The submarginal borders of both wings have a light violet sheen as do the forewings' cell area. The species is common in urban areas where its host plant is found. Where the effect from pesticides are minimised, the butterfly can always be found fluttering around the leaves of the Weeping Willow in parks and gardens. The Leopard has a rather restless flight, always on the move as it flutters from flower to flower. 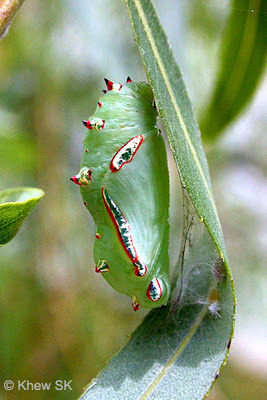 Rarely has it been observed with its wings opened flat to sunbathe, or stopping to rest with its wings folded upright. It's a busy butterfly - always moving and fluttering, as if there was a lot of work and feeding to do all the time. 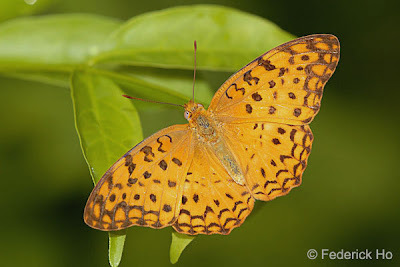 Being skittish, it is not the easiest of butterflies to photography, even though it is common. Perhaps the cool early morning hours and the later part of the evening would be the best time to try to catch this butterfly at rest where it will be more cooperative for a shot. 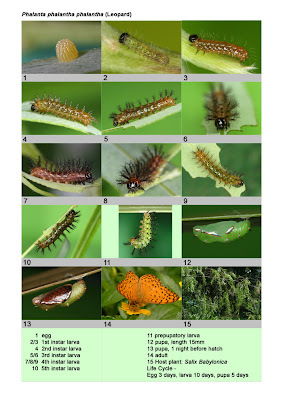 Males and females look very similar, and around the host plant, often several of them can be found fluttering and frolicking amongst the long drooping leaves of the Weeping Willow. 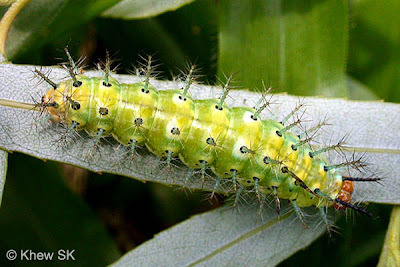 The caterpillars are well camouflaged, but the pupa bears very attractive red outlined silvery spots. 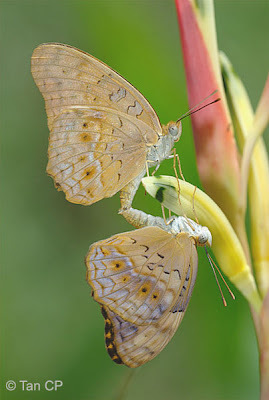 The life history as recorded is rather short - around 16-18 days in total from egg to eclosion. The Leopard is certainly one of the urban butterflies that will be appreciated for its beauty and rich cheery orange colour, and a species that should be helped to survive in our urban parks and gardens through judicious horticultural planting and the minimisation of the use of pesticides.